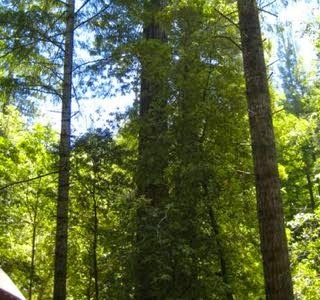 Green Diamond Resource Company to log near Redwood National Park. 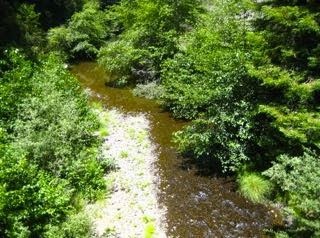 This THP is about 5 miles NE of Trinidad, CA and .6 mi SW of Redwood National Park at an elevation of 600 to 1,800 feet. 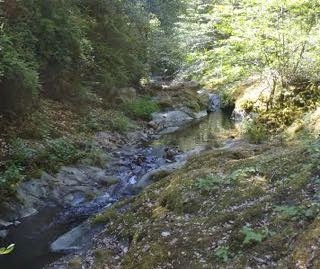 The THP area drains into Maple Creek which flows into Big Lagoon at the Pacific Ocean and contains coho, chinook salmon, coastal cutthroat trout and steelhead. 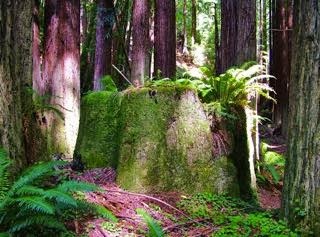 Green Diamond Resource Company is planning a tractor and cable logging operation in Douglas fir and redwood forests. 7 road drainage sites are planned for work including rocking, dip construction, crossing repair and culvert repair/replacement. 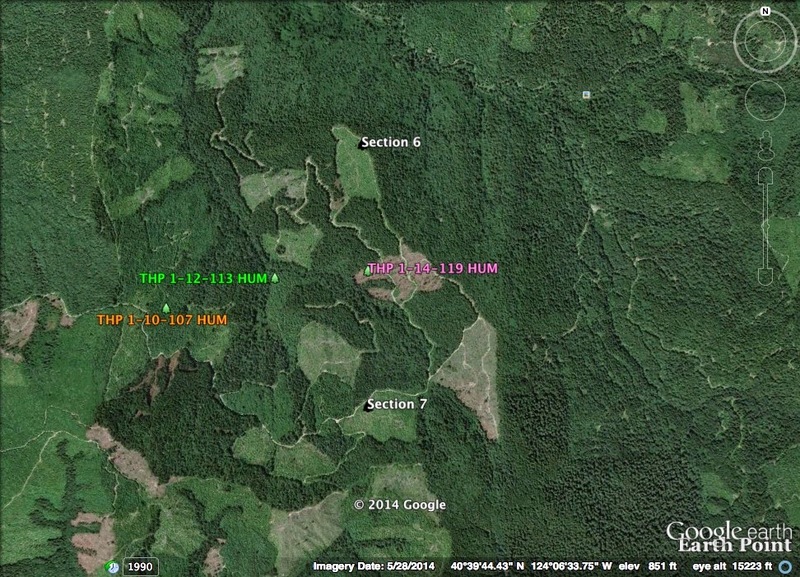 There is a marbled murrelet stand within .25 of unit A and the BL2000 and BL2661 roads, and spotted owl nesting territories within .25 mi of unit B. 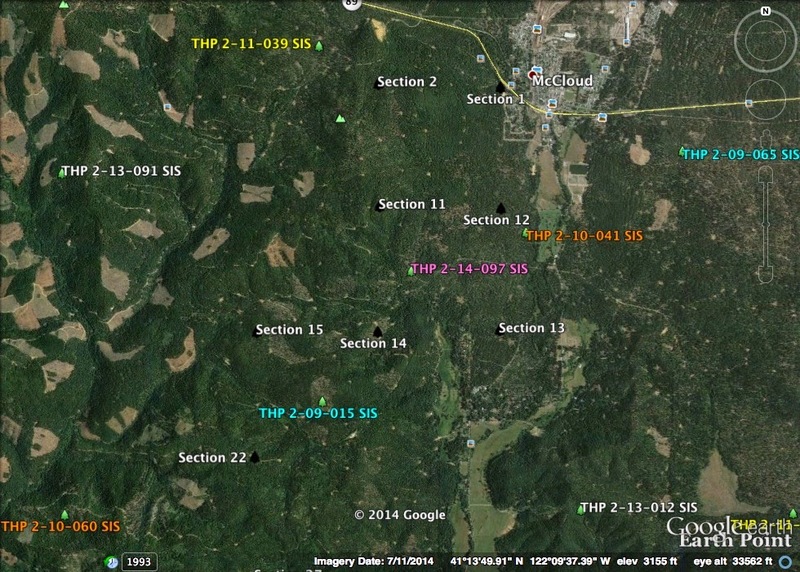 More information is available on the THP Tracking Center website. 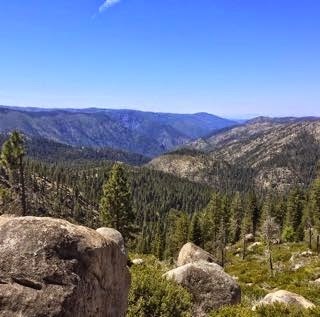 This THP is about 16 miles north of Bieber, CA and Highway 299 at an elevation of 4,240 to 4,560 feet. 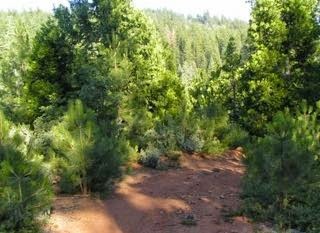 Sierra Pacific Industries is planning a mostly clearcut tractor based logging operation in ponderosa pine, white fir and incense cedar forests. 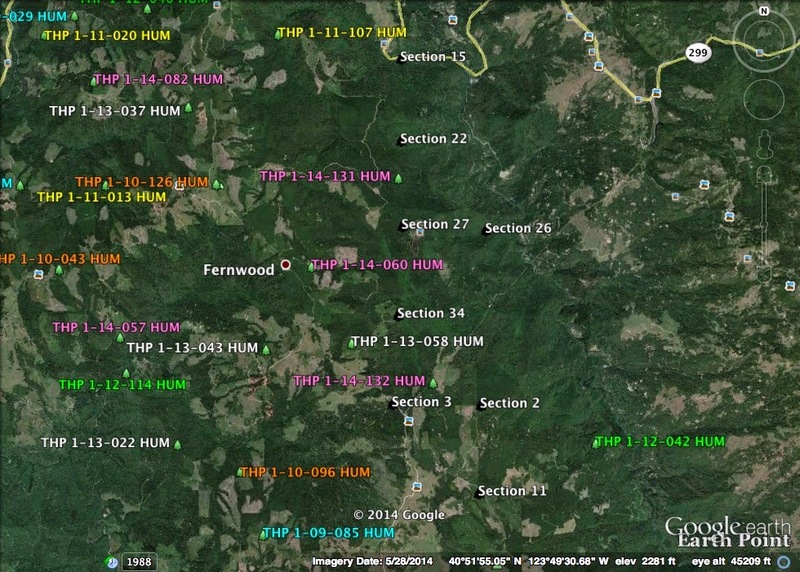 18 goshawk sightings were reported from within unit 119C to 1.9 miles from the THP area. 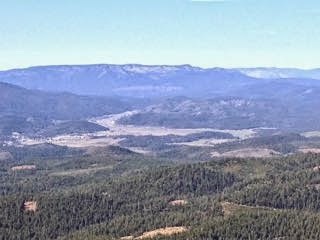 There is an osprey within 1.7 mi in section 14, a bald eagle within 1.3 mi in section 14, and a great blue heron was reported to within 1.3 mi in section 3. 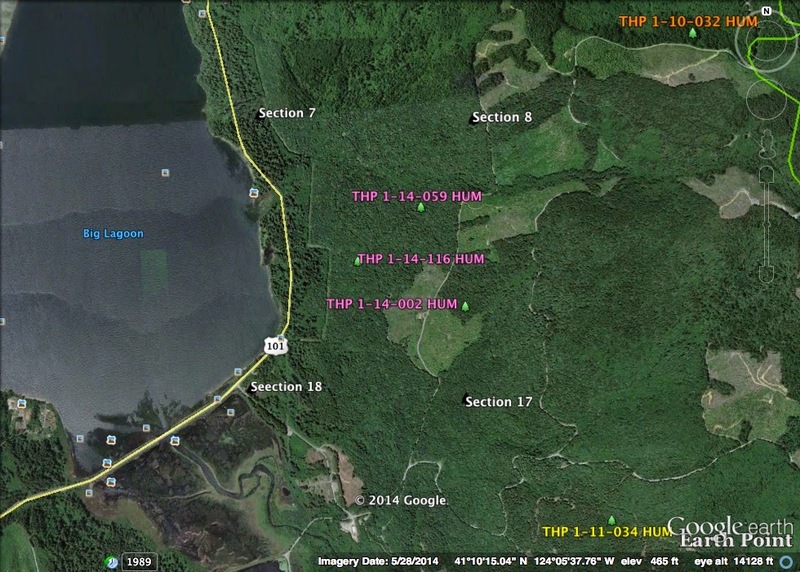 Five greater sandhill cranes were reported between 1,253 feet to 1.7 mi from the THP area. 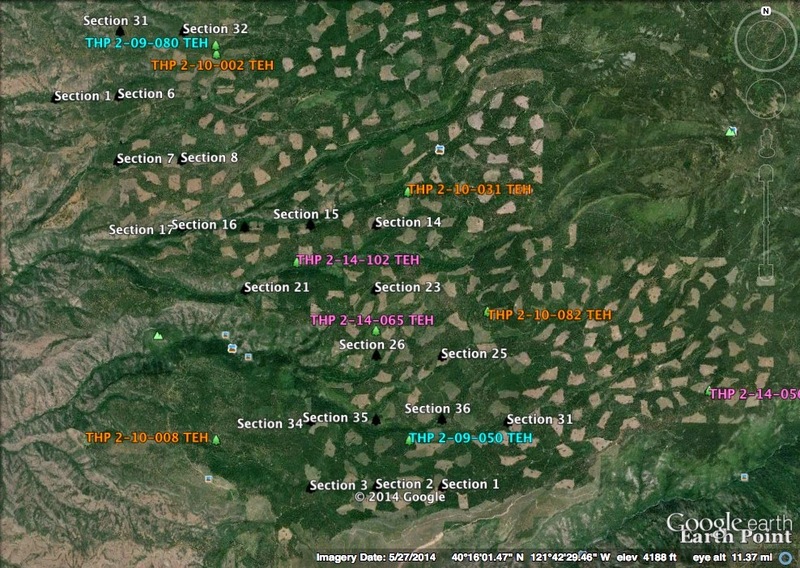 10 sensitive plant species were found in the THP area including; longbeard mariposa lily, disappearing monkey flower, Greene's tuctoria, slender Orcutt grass, Castlegar hawthorne, Mountain Lady's Slipper, Susanville milk vetch, Sierra beardtongue, profuse flowered pogogyne and California golden banner. 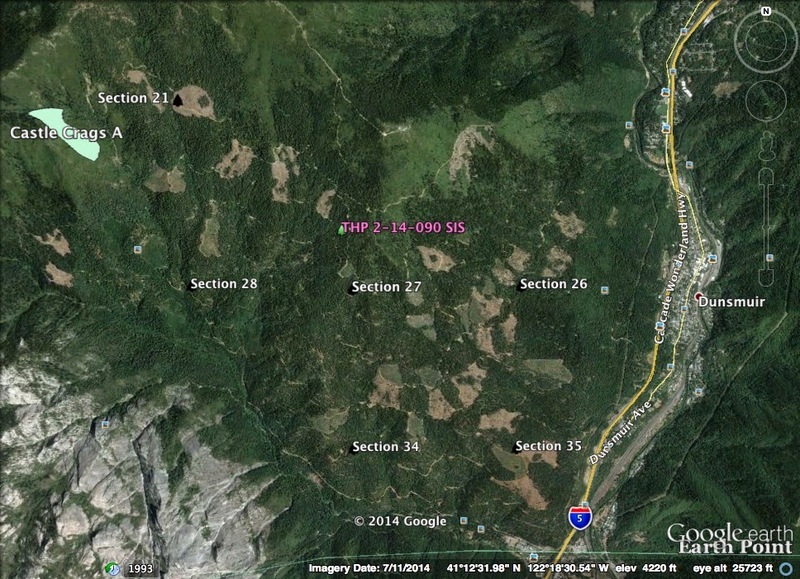 Roseburg Resources Company to clearcut west of Dunsmuir and I-5. 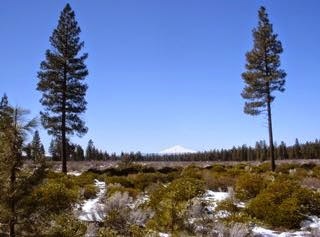 This THP is just west of Dunsmuir, CA near Railroad Park Campground and Castle Craigs State Park at an elevation of 2,400 to 4,800 feet. 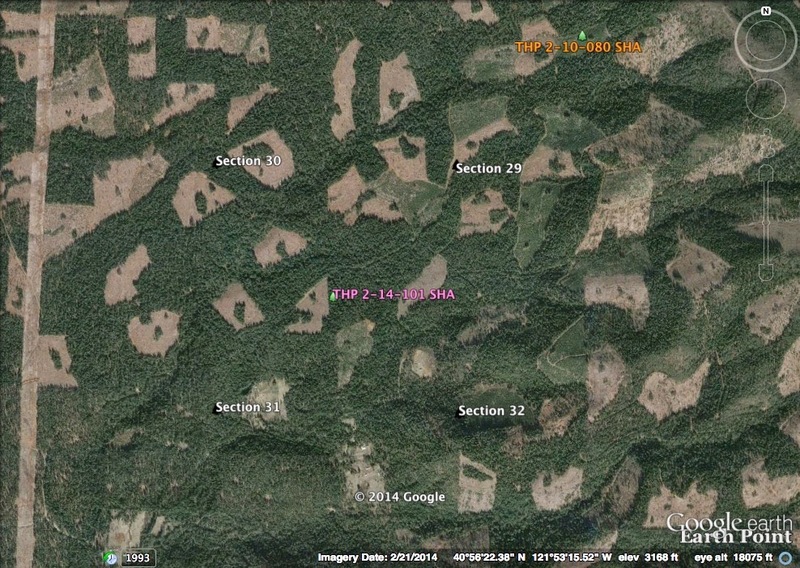 Roseburg Resources Company is planning a clearcut tractor and cable logging operation in Douglas fir, ponderosa pine, white fir, incense cedar and sugar pine forests. 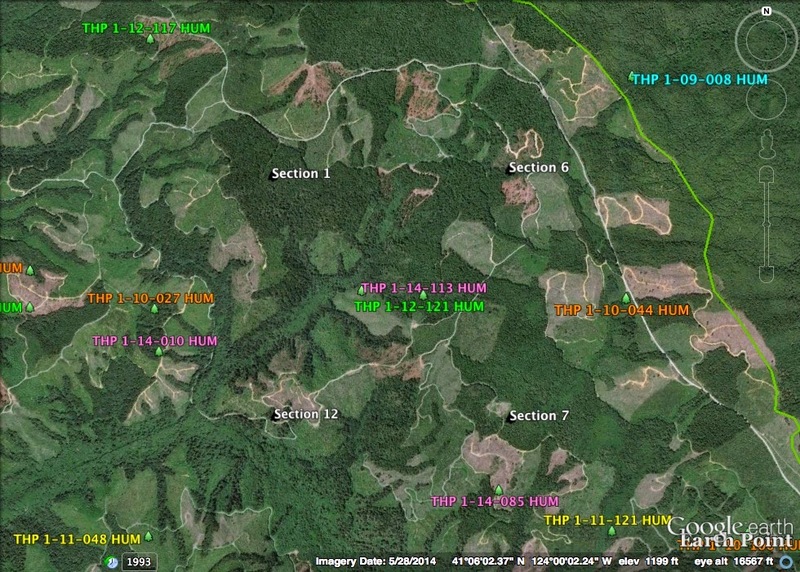 The THP area has 16 landslide terrain sites mostly related to watercourses including earth flows, bank slumping, fill failures, hummocky ground and steep headwalls/scarps. 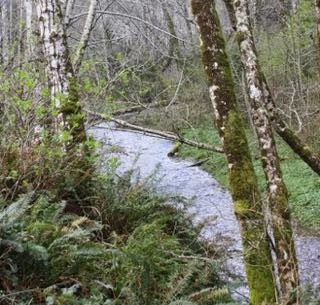 End-lining is proposed at 3 locations that are over 50% grade that do not flatten before a watercourse, and 4 landings are proposed for use inside class III (intermittent) watercourses, including a skid trail inside a class III watercourse. 11 road drainage sites are planned for work including rocking, dip construction and culvert repair and replacement. 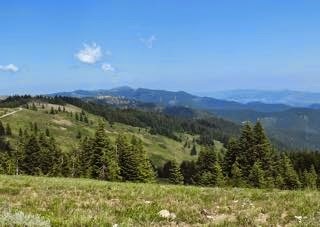 There is an historic goshawk nest within the NW quarter of section 35, and an osprey nest is located within the SW quarter of section 25, approximately 2,300 feet NE of unit 3501. 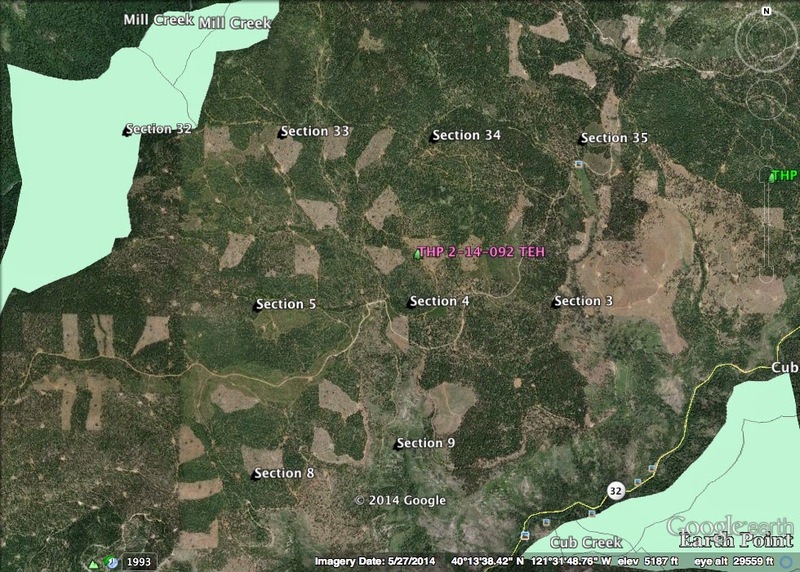 Foothill yellow legged frogs were reported to be in Little Castle Creek nearby, and a pacific tailed frog was reported to be within .5 mi of THP units 2802 and 2101 in Little Castle Creek. 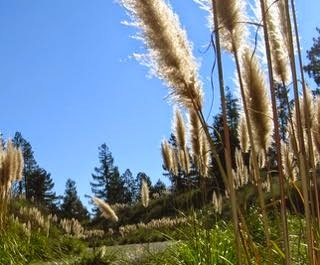 Cascade grass of Parnassus was found near a water hole and along a spring in unit 3502, and northern clarkia was found along a haul road. More information is available on the THP Tracking Center website. 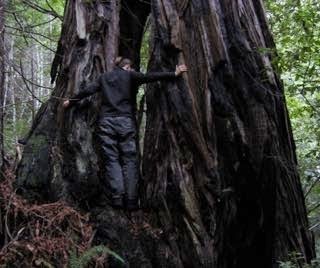 Humboldt Redwood Company to log in large tree fisher, spotted owl and marbled murrelet stands. 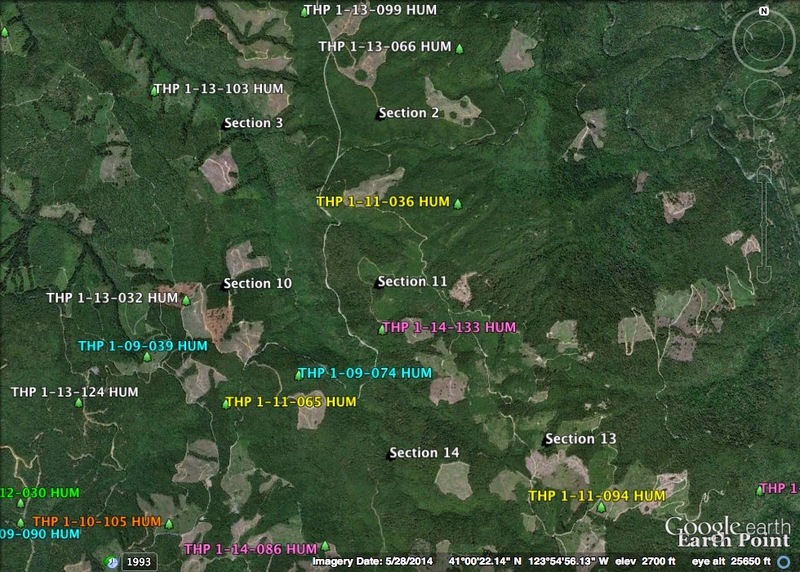 This THP is about 7 miles SE of Scotia, CA and 1.5 mi NW of Redcrest, CA and Highway 101 near Humboldt Redwoods State Park (units 1, 3 and 4 are adjacent). 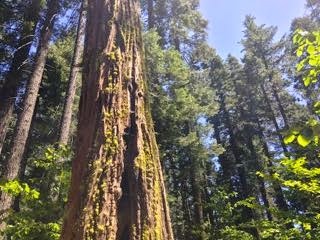 Humboldt Redwood Company is planning a tractor and cable logging operation on steep and unstable slopes in redwood, Douglas fir, and grand fir forests at an elevation of 62 to 2,955 feet. 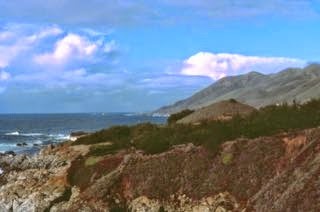 The THP area flows into the Eel River which is listed as impaired for sediment and temperature, and there are 21 active and dormant landslide terrain features including debris slides, earth flows and disrupted ground. 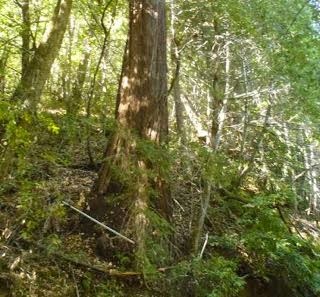 Large tree logging is planned inside marbled murrelet stands within units 1 and 5, and Humboldt Redwood Company wants to use tractors in areas designated for cable logging. Twenty-five road drainage sites are planned for work including rocking, dip construction, culvert repair and replacement. During project layout, a fisher was seen running across the road inside unit 3. 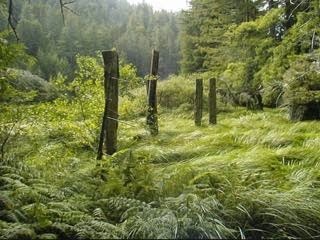 For spotted owl nesting territory HUM0099; this THP will reduce nesting/roosting habitat by 12 acres within 1.3 mi; for spotted owl nesting territory HUM0097; this THP will reduce nesting/roosting habitat by 43 acres within 1.3 mi; for spotted owl nesting territory HUM0147; this THP will reduce nesting/roosting habitat by 9 acres within .7 mi, and by 131 acres within 1.3 mi. 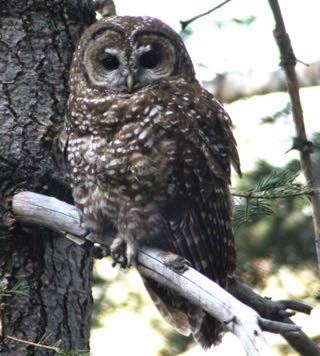 There are 2 historic spotted owl nest trees in unit 1. 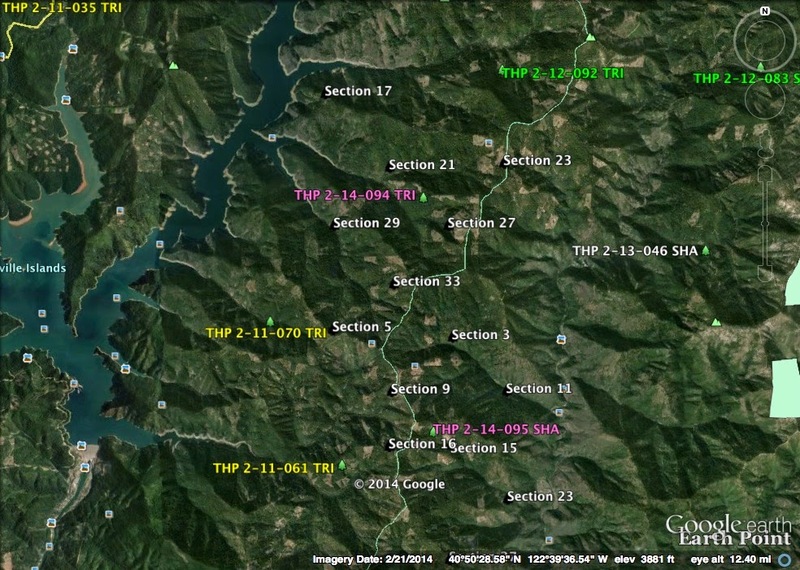 More information is available on the THP Tracking Center website.